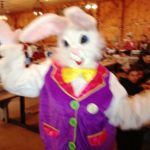 The “Easter Great Gathering”, a fun-filled family traditional event since 2011, is being held on Saturday, April 15, 2017 at Red Apple Farm, Phillipston, MA to benefit the Phillipston Congregational Church. 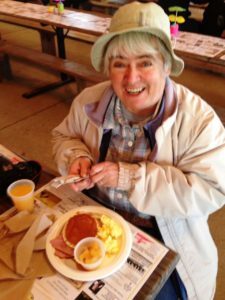 The 6th Annual Brunch with the Easter Bunny will be held in the barn including Ham, Eggs, Pancakes, Sausage, Home Fries, Toast, Fruit & Beverages being served continually between 8 am and 1 p Cafeteria style. Tickets are $10 for adults, $5 for kid’s ages 3 to 10 and Seniors 65+. If you purchase your tickets in advance, you will save $1 each, for tickets call: (978) 939-8901 or (978) 249-7517. Free Egg Hunts will be held for the children at 9, 10 and 11 am. There will be separate Toddler & Preschoolers’ Hunts. The Teen Egg Hunt with prizes will be held at 12:30 pm. At “High Noon”, an Adult Egg Hunt, with a limited number of tickets being sold, some of the prizes being a Chrome book, a Fit bit Charge 2 and many more exciting prizes. For the Adult Egg Hunt you must be 18 years or over and be present to participate. For advance tickets call (978) 939-5608. There will be baby farm animals for the children to enjoy. Vendors will be in the store with many Holiday Favorites. There will be great gifts for the whole family including Fresh Cider, Donuts & Coffee, Easter Raffle Baskets, “Home Sweet Home of Yore” Quilt Raffle & Craft Items, Easter Flowers, Bunny Ears, Face Painting, Pictures with the Bunny, Cotton Candy, Honey Products and Hand-poured Soy Candles.